The International Monetary Fund (IMF) has warned central banks and finance ministers to stay focused on keeping inflation under control. At its annual meeting, the IMF also stressed that countries have to work to deal with financial market turbulence. The IMF's Policy Committee made progress on attempts to give emerging economies more voting power. Former French Finance Minister Dominique Strauss-Khan takes over as IMF head at the end of the month. His appointment resurrected arguments about whether Europe should always choose the head of the IMF while the US gets to nominate the head of the World Bank. The new World Bank head, Robert Zoellick, is presiding over his first set of meetings since he took over from Paul Wolfowitz, who resigned in May. 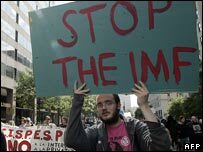 The IMF's discussions reforms to voting systems are a reaction to the perception that developed nations have too much power over the IMF and World Bank. Its policy committee is confident that at its meeting this time next year it will be able to finalise agreements to double the number of basic votes in which each member has equal voting power. "I think that consensus includes certainly that there will be an increase in the voice of emerging economies and developing countries as a whole," said the outgoing IMF chief Rodrigo de Rato said at the summit.